Why should you get a Moto G case? Although Moto G is very affordable, you still should invest a few bucks on Moto G case to protect your phone from scratches, bumps, smudges and dirt. There are many options for your Moto G case. The price varies from a few dollars to more than $50. Of course different Moto G cases give different levels of protection. But the expensive Mot G case does not necessarily give better protection. This Moto G case guide will show you some cases or covers for Moto G that give you the maximum value for your money. Understand the protections you need. If you drop your smartphone quite often, you probably need Moto G case with decent impact protection, e.g., OtterBox case. Check the quality. The material used for case or cover is extremely important. Poor quality material actually may not provide any protection to Moto G. A non-fit case may even damage your phone. When pursing online, you should read the reputation of the store and reviews of the specific Moot G case. Know your preference. What design do you like for your Moto G case? A back case or a flip cover? Black? white? Anyway, this is purely personal choice. You should be able to find the desired case for your Moto G. Don’t be lured by any “sales” pitches. Have a targeted weight (and size) of your Moto G case. Some Moot G cases or covers may be heavier than your phone. Some may be just 20-30 grams. Most bumper cases are slight larger. Of course, the following Moto G case recommendations will save you time in comparing the cases and covers for your Moto G.
This Moto G case is simple and affordable. The case is flexible (so it is easy to get it on or take it off), but it is made of decent quality thermoplastic polyurethane (TPU). This Moto G case fits Mot G surprisingly well. It does not add bulk to your Moto G: it weighs less than 20 grams. The design of this Moto G case is minimal, but it looks very impressive. The raised edges design of the case helps protect the Moto G screen from scratches when placed the device face down. The raised edge may also protect the screen if Moto G drops. 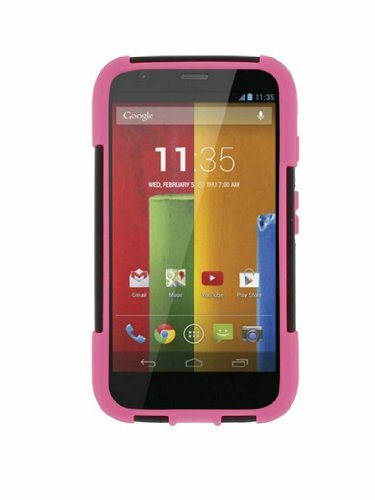 But overall, the case mainly protect your Moto G from scratching, dusts and bumps. It will not provide the need protection from drops of impacts. So, this ultra slim bumper case is for Moto G owners who need basic protection without adding bulk. It is quite stylish as well. This is probably the the cheapest hybrid Moto G case, with decent quality. The list price is $24.99, but most of the time the case is offered in less than $10. It is really a good deal as you can get this case in less than $10. Like any other dual layer hybrid case, the inner soft silicone layer absorbs the shock and impact. The outer polycarbonate plastic layer delivers additional protection and and enhanced grip. The material quality is acceptable. The case fits Moto G quite well. 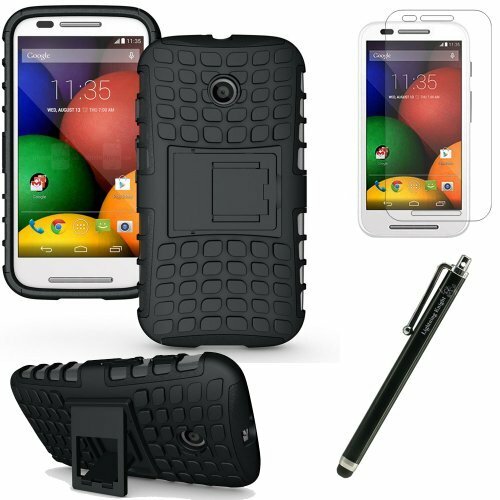 This Moto G case also comes with kickstand, which is ideal for watching videos, browsing the web and reading. It can stand in both landscape and portrait modes. This hybrid case can give decent protection from scratches, bumps drops, and even impact, with very low price tag. If you think the $40 OtterBox for Moto G is a bit expensive, but you need high level protection, this dual layer Moto G case is for you. Some Moto G owners may prefer a flip cover case. This PU leather case is a good option: cheap but with decent quality. The design of this Moto G flip case is very similar to other wallet -type case. The features are also similar to others. If you used some wallet-type case before, there probably be no surprise for you. The material (the PU leather) used in thsi Moto G case is not the best, but the quality is acceptable. The case also fits Moto G very well. You can choose different colors for this Moto G case: black, white, blue, red, pink and purple. The free screen protector in the box is not so good, and you probably want to get your screen protector somewhere else. In short, if you are looking for a normal and affordable PU leather flip cover case, this wallet-type Moto G case is a good option. 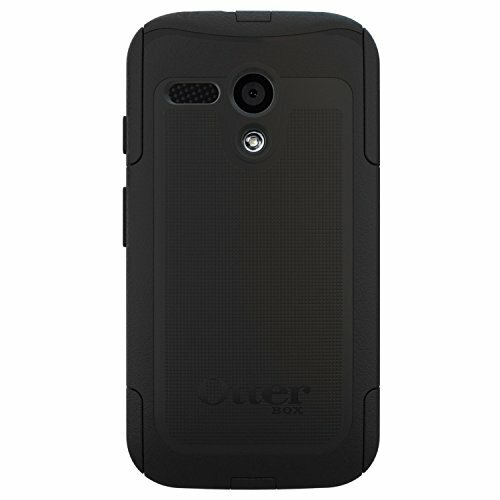 OtterBox is well known for their rugged protection cases. It is the De facto standard of smartphone cases that can provide ultimate protection of the smartphones. This case provides reliable protection from drops, bumps and shock without taking away from the usability of your phone’s features. Port covers block the accumulation of dust and lint in ports and jacks. The screen protector is built into the case to prevent scratches and scrapes to the glass display. There are two colors you can choose from: black/black and key lime (green/grey). In short, OtterBox Defender series case for Moto G probably provides the best protection for Moto G. It is also a bit heavier than other cases we recommended. The brand tells everything. But remember, this Moto G case is not cheap. Have you got your Moto G case? 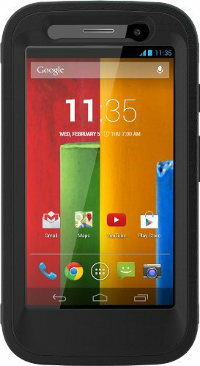 Or do you have any recommendations on Moto G case? Pleas let us know in the comment box below. Do you want to get date printed on photos? No, most Android camera apps don’t have this feature. I highly recommend the Trident Aegis case. I’d put it up against the OtterBox any day and it’s more affordable. I’ve been using the OtterBox Commuter – it’s lighter, smaller and less protective than the Defender, but it still gives a very good level of protection. Not only has it kept my Moto G in pristine condition for over a year (despite some severe drops from height onto stone and concrete), but the case itself also shows no real signs of wear. Only downsides as far as I’m concerned is that it takes a little bit more effort to press the volume/power buttons (but not that much) and it makes the phone significantly bulkier (but not that much). Highly recommended. Thank you for sharing your experiences with Otterbox Commuter case for moto g. I agree it provides sufficient protection for most users. Due to button design in modern smartphones, it may require a bit more efforts to reach them when a case is on. how does the damn thing open up so i can put the phone in it? the instructions don’t tell you anything.